We absolutely love to sit and watch the traffic drive by our store and "rubberneck" when they see all the flowers. 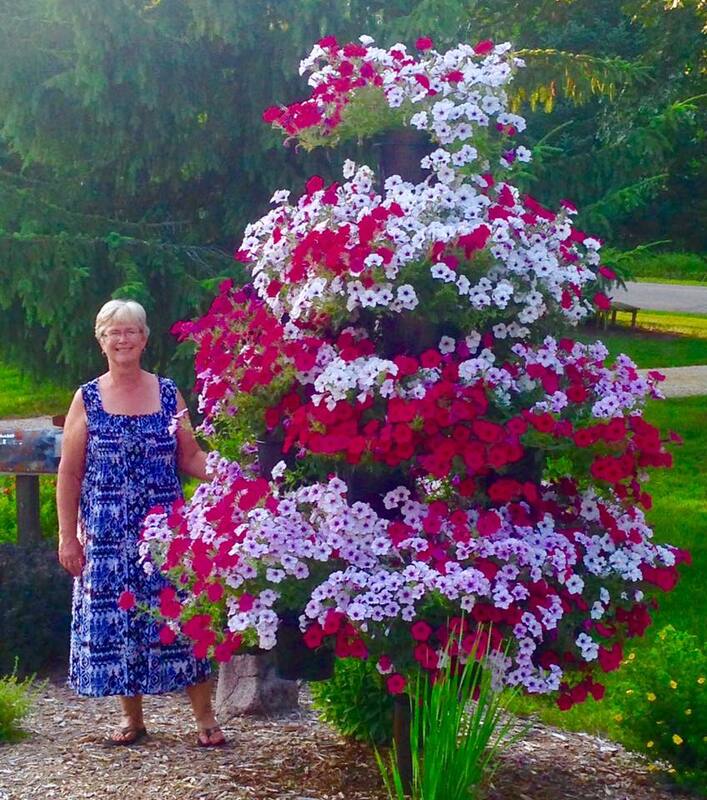 One of our main attractions every year is our petunia "tree." At over 6 feet tall, it is just a mass of flowers and certainly grabs your attention when driving by. 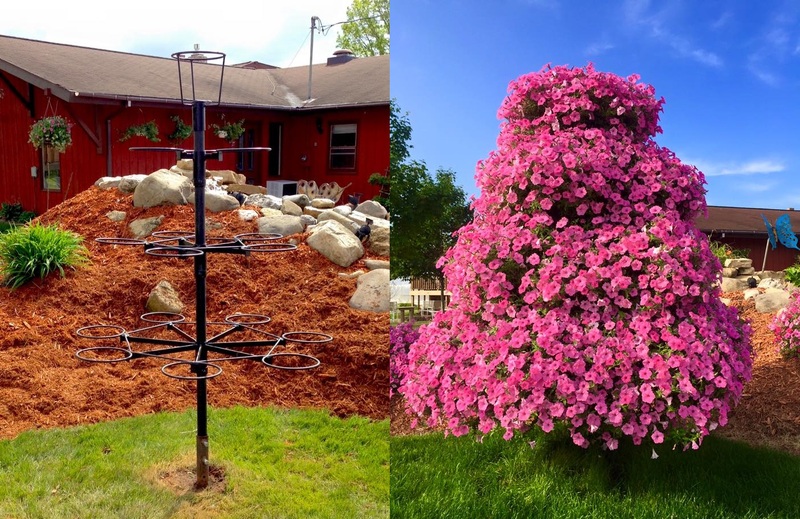 Going back 30 some years, my dad had the metal frame for a petunia tree built by a local named Art Sheels. He welded up a few of them and sold them to at least 3 individuals that I know of, my dad being one of them. 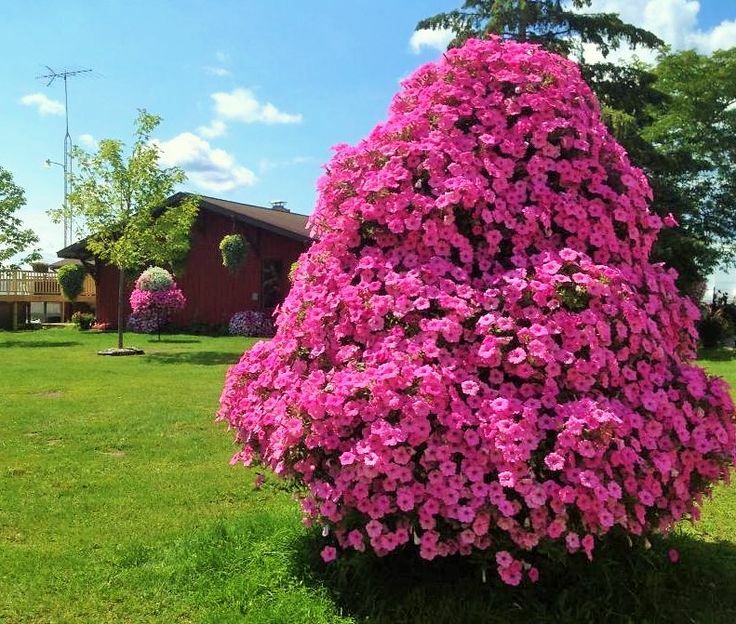 Fast forward to a few years ago, I had wanted the infamous petunia tree that I grew up having in our own front yard. My dad had sold it and I couldn't find any within a reasonable price. Looking on the internet, most trees were not even close in size and cost upwards of $2,000. I kept bugging the one guy I knew who had one, but he just didn't want to sell. The other individual approached me and I immediately said "YES!" He actually had THE tree that my dad had and so it was a joyous occasion to have the tree back on our property planted up in all its glory. The tree holds sixteen 10" pots which we put one Proven Winner Bubblegum super petunia in. Our friends plant theirs up with Wave Petunias which looks gorgeous also. It's kind of fun to tell people the storied past of our petunia tree, now that it has returned home. It sure gets a lot of attention and many want to know what kind of tree blooms like that, thinking that it is some special species of tree that no one has seen before. The puzzled looks are especially funny when we wrap real bark around the trunk to give an extra authentic look.